Well, it's a bit of a bridging episode this, as we get reintroduced to some old faces and we see more of the change in Rick (his lack of confidence, his hurt, his powerlessness, his disability, his anger). 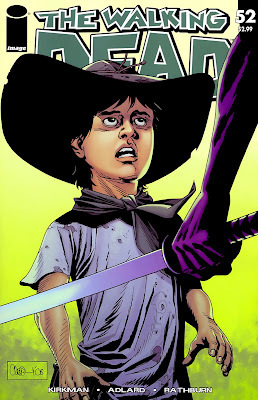 Carl has a few moments where we still glimpse the child who has somehow got this far amongst all this horror and death. The main returning character plays up to their strengths, and it is great to see them in action again, and it seems as if Rick is glad of the relief. There are a couple more who make an appearance.......but that would spoil it wouldnt it? Go read it. I still love this title. 8 out of 10.